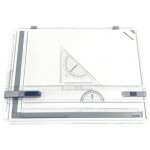 Draftex, portable drawing board A3Double Locking Parallel Rule Featuring a Push Button Release and Additional Lock on Right SideGraduated Compass Plotting Scale along Bottom EdgeHorizontal and Vertical Metric Rule MarkingsMagnetic Paper Clamping Rails with Additional Corner ClampSet Square ..
A1 - single locking white finish board with a parallel rule and adjustable back stand. 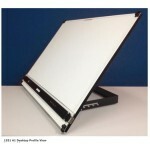 (1521)The Draftex 1521 Portable Desktop Drafting Unit is designed for A1 size drawings and is fitted with our Draftex Parallel Motion Rule. This device is guided by wires and runs in a perfectly parallel l..
A2 - portable board with Carry handle. 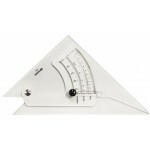 single locking white finish board with a stand. and parallel rule. 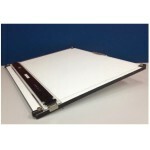 (1422)The Draftex 1422 Portable Desktop Drafting Unit is designed for A2 size drawings and is fitted with our Draftex Parallel Motion Rule. 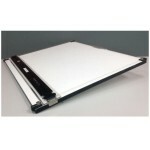 This device is guided by wires and runs in a perfec..
A1 - single locking, parallel rule portable white finish board with Carry handle (1421)The Draftex 1421 Portable Desktop Drafting Unit is designed for A1 size drawings and is fitted with our Draftex Parallel Motion Rule. 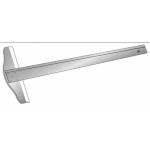 This device is guided by wires and runs in a perfectly parallel l..
DRAFTEX with Bevelled Edges - 60cm ..
DRAFTEX with Bevelled Edges - 90cm ..